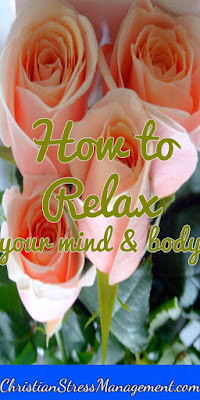 This blog post is a book excerpt from Rules of Relaxation which teaches you 150 simple physical, medical and spiritual relaxation techniques. When you work for long without taking a break, you are prone to making mistakes which increase your stress. Therefore, take regular breaks so that you can recover and replenish your energy reserves. Overworking also makes you more susceptible to stress-related illnesses. Work with moderation and don't let your work pressures result in high blood pressure. Working late into the night, during holidays and over weekends also makes you more prone to social problems due to absenteeism partnering and parenting. Therefore, cease from overworking today before you are seized by physical, mental, emotional and social problems. Some studies suggest that consuming honey can alleviate anxiety with often accompanies stress. Therefore apply a tablespoon of honey to slices of whole grain bread to create a relaxing snack since the bread will increase levels of serotonin in your body and impart a feeling of emotional well being. You can also add a tablespoon of honey to a cup of chamomile herbal tea to create a sleep-inducing drink if you are suffering from stress-related insomnia. An attitude of gratitude is very important in Christian stress management since it reminds you of the great things that God has done for you in the past and this serves as proof that He is still able to do other great things for you in your present and future including resolving your stressful situation because He is still the same great God. Therefore, make it a habit to count your blessings instead of counting your hassles. Each day, write down three things that you are grateful for so that when the going gets tough, you can read your gratitude lists for encouragement. Go the extra step and emulate David who carried God’s wonderful works etched in his heart. This helped him when he faced Goliath because he was able to remind himself that The Lord, who delivered me from the paw of the lion and from the paw of the bear, He will deliver me from the hand of this Philistine (1 Samuel 17:37) and this confidence in God’s power enabled him to fight fearlessly. Dancing is a great activity to engage in when you are stressed because it is a form of aerobic exercise. It, therefore, helps your body to burn stress hormones and this effect reduces your chances of developing a stress-related illness. Dancing also elevates endorphin levels which make you feel better. Understand that you need to escape everyday to a solitary place where you can pray. Try and escape for an hour in the morning or when you are least likely to be disturbed. As you do so, escape preferably to a place that is physically away from your stressors. This solitary place can be your bedroom, your office, or a church. If you are not able to physically escape to a solitary place, you can mentally escape to a solitary space in your mind. To do this, tune out the world and tune into God as you pray. You can do this when walking to the bus stop, driving home or even in the middle of a disagreement. To massage simply means to apply pressure and motion to the soft tissues of the body. 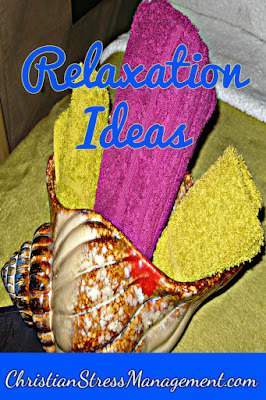 This reduces tension in the muscles and thus helps you relax. If you are giving yourself a massage, avoid massaging over areas with skin diseases, swellings, recent scars, varicose veins and also over your abdomen during pregnancy. When in doubt, consult a professional massage therapist and let them iron out the kinks in your muscles. Arrange the items that you use and those of sentimental value neatly. Finally, store those that fall in between these categories away from your view. Studies have shown green tea and black tea contain a compound known as L-Theanine which reduces your body’s psychological and physiological responses to stress. These herbal teas also contain antioxidants which are useful for maintaining health. Jogging is a great relaxation technique since it is a form of aerobic exercise. It thus keeps your body healthy during stressful times since it burns stress hormones and reduces your likelihood of developing stress-related illnesses. Jogging also elevates levels of the “feel good” hormones known as endorphins which make you feel better. Therefore schedule time to jog for around 30 minutes thrice a week and you will be definitely running away from the hazardous effects of stress. Heed the Lord’s command and keep your Sundays sacred, a day dedicated to God. Slow down on Sundays. Go to church in the morning and engage in restful activities in the afternoon to recover from the detrimental effects of the past week's stress. Take a breather from your regular life and its obligations. Don't run around trying to complete office work or housework. If you must work on Sundays, then dedicate another day to the Lord so that He may renew your spirit. Lavender contains a compound known as linalool which has been shown to reduce some of the effects of stress on the body. This lovely herb has also been used for eons because of its soothing scent as well as other health benefits. Therefore lace your sweet dishes with lavender to minimize the effects of stress on your body and ensure that you inhale its soothing scent as you do so. Meditation is a very effective relaxation technique because by focusing your mind on one thought, your heart slows down, tension dissipates and your body is able to relax. Contemplate it, ruminate it and believe it. If your mind wanders to your fears, reflect on the Scripture again until your attention shifts to His protection and your fears are slain. When you begin struggling with drowsiness, exhaustion, reduced concentration, diminished effectiveness or increasing errors of judgment in the middle of your work day, grab a power nap and you will wake up energized and refreshed. Power naps, which should not exceed 15 minutes, are best taken early in the afternoon just after lunch rather than late in the evenings before supper. Therefore take a few moments to snooze when your schedule is stressful and you will find that a catnap can be very calming after a chaotic morning and forty winks very rejuvenating when you have a demanding afternoon waiting for you. Consuming foods with white flour causes rapid surges in blood sugar levels which are followed by rapid drops. These changes are associated with the release of the stress hormone known as cortisol. Therefore, omit white flour from your diet by steering clear from foods like white bread, cakes, and cookies. 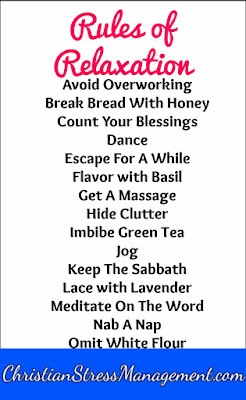 Replace them with foods prepared from whole grains like brown bread. 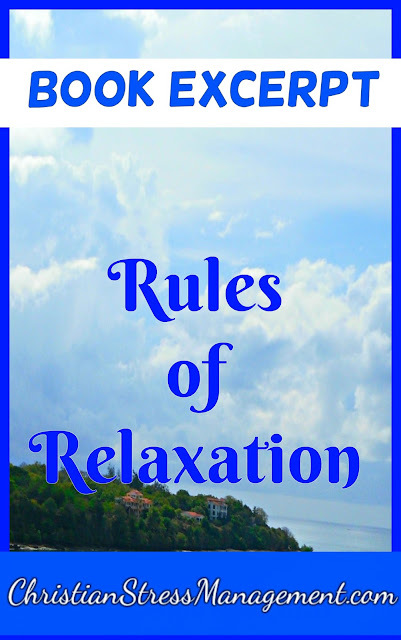 To learn all the 150 relaxation techniques read Rules of Relaxation. Great ideas! I especially love dancing. Just cleared out the ottoman in my living room so I could dance more, lol...not really but I do have more room to move when I turn on my jam. I've also recently found a couple of Christian meditation sites that have been great! Found you from the Chasing Joy Sunday link up. Yes, dancing is a great stress reliever because it incorporates two stress relievers - movement and music -. It can even include a third - singing- if you sing as you dance. I always love the verses where Jesus went alone to pray. He modeled pray for us numerous times and we still are asking 2,000 years later how to pray. Great tips! Thanks for stopping by! You are welcome and it is important for us to spend some time alone with God in prayer. Yes, I use basil and it really helps. Thanks for helpful tips.